Dialectology (from Greek διάλεκτος, dialektos, "talk, dialect"; and -λογία, -logia) is the scientific study of linguistic dialect, a sub-field of sociolinguistics. It studies variations in language based primarily on geographic distribution and their associated features. Dialectology treats such topics as divergence of two local dialects from a common ancestor and synchronic variation. Dialectologists are ultimately concerned with grammatical, lexical and phonological features that correspond to regional areas. Thus they usually deal not only with populations that have lived in certain areas for generations, but also with migrant groups that bring their languages to new areas (see language contact). Commonly studied concepts in dialectology include the problem of mutual intelligibility in defining languages and dialects; situations of diglossia, where two dialects are used for different functions; dialect continua including a number of partially mutually intelligible dialects; and pluricentrism, where what is essentially a single genetic language exists as two or more standard varieties. Hans Kurath and William Labov are among the most prominent researchers in this field. In London, there were comments on the different dialects recorded in 12th century sources, and a large number of dialect glossaries (focussing on vocabulary) were published in the 19th century. Philologists would also study dialects, as they preserved earlier forms of words. The first comparative dialect study in Germany was The Dialects of Bavaria by Johann Andreas Schmeller, which included a linguistic atlas. In 1876, Georg Wenker sent postal questionnaires out over Northern Germany. These postal questionnaires contained a list of sentences written in Standard German. These sentences were then transcribed into the local dialect, reflecting dialectal differences. Many studies proceeded from this, and over the next century dialect studies were carried out all over the world. Joseph Wright produced the six-volume English Dialect Dictionary in 1905. Under the leadership of Harold Orton, the University of Leeds became a centre for the study of English dialect, and set up an Institute of Dialect and Folk Life Studies. In the 1950s, the university undertook the Survey of English Dialects, which covered all of England, some bordering areas of Wales and the Isle of Man. In addition, the University undertook more than 100 dialect monographs before the death of Harold Orton in 1975. The Institute closed in 1983 to accommodate budget cuts for the University, but its dialectological studies are now part of a special collection, the Leeds Archive of Vernacular Culture, in the University's Brotherton Library. This shift in interest consequently saw the birth of Sociolinguistics, which is a mixture of dialectology and social sciences. However, Graham Shorrocks has argued that there was always a sociological element to dialectology, and that many of the conclusions of sociolinguists (e.g. the relationships with gender, class and age) can be found in earlier work by traditional dialectologists. Dialect researchers typically use predominantly interview questionnaires to gather data on the dialect they are researching. These are not to be confused with what is called written questionnaires, which have had some applications in dialectology as well and which, recently, have had a comeback in linguistics more generally. There are two main types of questionnaires; direct and indirect. Researchers using for their face-to-face interviews the direct method will present the subject with a set of questions that demand a specific answer and are designed to gather either lexical or phonological information. For example, the linguist may ask the subject the name for various items, or ask him or her to repeat certain words. Indirect questionnaires are typically more open-ended and take longer to complete than direct questionnaires. A researcher using this method will sit down with a subject and begin a conversation on a specific topic. For example, he may question the subject about farm work, food and cooking, or some other subject, and gather lexical and phonological information from the information provided by the subject. The researcher may also begin a sentence, but allow the subject to finish it for him, or ask a question that does not demand a specific answer, such as "What are the most common plants and trees around here?" Some have attempted to distinguish dialects from languages by saying that dialects of the same language are understandable to each other. The untenable nature of blunt application of this criterion is demonstrated by the case of Italian and Spanish cited below. While native speakers of the two may enjoy mutual understanding ranging from limited to considerable depending on the topic of discussion and speakers' experience with linguistic variety, few people would want to classify Italian and Spanish as dialects of the same language in any sense other than historical. Spanish and Italian are similar and to varying extents mutually comprehensible, but phonology, syntax, morphology, and lexicon are sufficiently distinct that the two cannot be considered dialects of the same language (but of the common ancestor Latin). Another problem occurs in the case of diglossia, used to describe a situation in which, in a given society, there are two closely related languages, one of high prestige, which is generally used by the government and in formal texts, and one of low prestige, which is usually the spoken vernacular tongue. An example of this is Sanskrit, which was considered the proper way to speak in northern India, but only accessible by the upper class, and Prakrit which was the common (and informal or vernacular) speech at the time. Varying degrees of diglossia are still common in many societies around the world. A dialect continuum is a network of dialects in which geographically adjacent dialects are mutually comprehensible, but with comprehensibility steadily decreasing as distance between the dialects increases. An example is the Dutch-German dialect continuum, a vast network of dialects with two recognized literary standards. Although mutual intelligibility between standard Dutch and standard German is very limited, a chain of dialects connects them. Due to several centuries of influence by standard languages (especially in Northern Germany, where even today the original dialects struggle to survive) there are now many breaks in intelligibility between geographically adjacent dialects along the continuum, but in the past these breaks were virtually nonexistent. The Romance languages—Galician/Portuguese, Spanish, Sicilian, Catalan, Occitan/Provençal, French, Sardinian, Romanian, Romansh, Friulan, other Italian, French, and Ibero-Romance dialects, and others—form another well-known continuum, with varying degrees of mutual intelligibility. 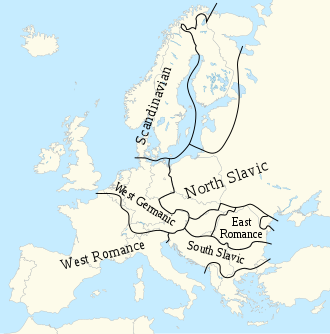 In both areas—the Germanic linguistic continuum, the Romance linguistic continuum—the relational notion of the term dialect is often vastly misunderstood, and today gives rise to considerable difficulties in implementation of European Union directives regarding support of minority languages. Perhaps this is no more evident than in Italy, where still today some of the population use their local language (dialetto 'dialect') as the primary means of communication at home and, to varying lesser extent, the workplace. Difficulties arise due to terminological confusion. The languages conventionally referred to as Italian dialects are Romance sister languages of Italian, not variants of Italian, which are commonly and properly called italiano regionale ('regional Italian'). The label Italian dialect as conventionally used is more geopolitical in aptness of meaning rather than linguistic: Bolognese and Neapolitan, for example, are termed Italian dialects, yet resemble each other less than do Italian and Spanish. Misunderstandings ensue if "Italian dialect" is taken to mean 'dialect of Italian' rather than 'minority language spoken on Italian soil', i.e. part of the network of the Romance linguistic continuum. The indigenous Romance language of Venice, for example, is cognate with Italian, but quite distinct from the national language in phonology, morphology, syntax, and lexicon, and in no way a derivative or a variety of the national language. Venetian can be said to be an Italian dialect both geographically and typologically, but it is not a dialect of Italian. A pluricentric language is a single genetic language that has two or more standard forms. An example is Hindustani, which encompasses two standard varieties, Urdu and Hindi. Another example is Norwegian, with Bokmål having developed closely with Danish and Swedish, and Nynorsk as a partly reconstructed language based on old dialects. Both are recognized as official languages in Norway. This conceptual approach may be used in practical situations. For instance when such a diasystem is identified, it can be used construct a diaphonemic orthography that emphasizes the commonalities between the varieties. Such a goal may or may not fit with sociopolitical preferences. One analytical paradigm developed by linguists is known as the abstand and ausbau languages framework. It has proved popular among linguists in Continental Europe, but is not so well known in English-speaking countries, especially among people who are not trained linguists. Although only one of many possible paradigms, it has the advantage of being constructed by trained linguists for the particular purpose of analyzing and categorizing varieties of speech, and has the additional merit of replacing such loaded words as "language" and "dialect" with the German terms of ausbau language and abstand language, words that are not (yet) loaded with political, cultural, or emotional connotations. ^ Frees, Craig (1991). "The Historiography of Dialectology" (PDF). Lore and Language. 10 (2): 67–74. Retrieved 11 February 2018. ^ "Archive Collection: Leeds Archive of Vernacular Culture, (Survey of English Dialects, and the Institute of Dialect and Folk Life Studies)". Retrieved 23 August 2018. ^ Shorrocks, Graham (1998). A Grammar of the Dialect of the Bolton Area. Pt. 1: Introduction; phonology. Bamberger Beiträge zur englischen Sprachwissenschaft; Bd. 41. Frankfurt am Main: Peter Lang. pp. 41–46. ISBN 978-3-631-33066-1. ^ Dollinger, Stefan. 2015. The Written Questionnaire in Social Dialectology. Amsterdam: Benjamins, chapter 1. ^ Chambers, J.K., and Trudgill, Peter. 1998. Dialectology. 2nd ed. Cambridge University Press. Cambridge. ^ Ferguson, Charles A. (1959-01-01). "Diglossia". WORD. 15 (2): 325–340. doi:10.1080/00437956.1959.11659702. ISSN 0043-7956. ^ Chambers, J.K.; Trudgill, Peter (1998). Dialectology (2nd ed.). Cambridge University Press. p. 6. ISBN 978-0-521-59646-6. ^ Clyne, Michael G. (1992). Pluricentric languages : differing norms in different nations. Clyne, Michael G., 1939-2010. Berlin. ISBN 978-3110128550. OCLC 858282330. Petyt, K. M. (1980). The Study of Dialect: An Introduction to Dialectology. The language library. London: A. Deutsch. Weinreich, Uriel (1954). "Is a structural dialectology possible?" (PDF). Word. 10: 388–400. Archived from the original (PDF) on 2016-03-04. Dollinger, Stefan (2015). The Written Questionnaire in Social Dialectology: History, Theory, Practice. IMPACT: Studies in Language and Society, 40. Amsterdam & Philadelphia: John Benjamins Pub. Co.